I was interviewed by Carolyn Bailey (from AR Zone), and VegFest Express for the Vegan Athletes Summit - held as part of VegFestUK in London THIS weekend. I'm giving a Skype talk about my 20-years-a-vegan journey, my vivalavegan.net website, and my latest (4th!) book on vegan athletes. See my blog about the event. See the orginal post here. Leigh-Chantelle is a published author, international speaker and consultant, who lives mostly in Brisbane, Australia. She gives lectures, workshops, consultations, and coaching on online marketing, communication, and vegan health & lifestyle. Leigh-Chantelle been vegan for almost 20 years, and has run the online vegan community Viva la Vegan! since 2005, bringing positive education, information and vegan outreach to a worldwide audience. Her most recent book is a collection of interviews with over 100 vegan athletes from all over the world. She previously founded and ran the not-for-profit environmental awareness Green Earth Group from 2009-2013, which put on two successful all-vegan environmental festivals in Brisbane. Here she speaks with us about veganism, about fitness and about what we have to look forward to from her at the VegfestUK Vegan Athletes Summit. How, and why did you begin living vegan and advocating for animals? I became vegan almost 20 years ago - it’s my anniversary in January! - after being vegetarian before that for two years. When I was younger, my family and I used to eat a leg of lamb for Saturday night dinners. I knew that it was someone’s leg because that was what it was called. There was a piece of the leg my sister and I used to like to eat, and I asked my Mum one night what part of the leg it was. She said it was the Achilles tendon. I looked down at my leg knowing that I had the same tendon as the roasted lamb’s leg on the kitchen bench. That was when I first made the connection between the life that once was and the death I was about to consume. I was in year 10 at high school and this was the beginning of 1994. I stopped eating “red meat” then but was still consuming chicken flesh and calamari. When I went on a month-long school camp in mid-1994, we looked after chickens and I never have eaten any chickens since. I didn’t want to eat others that I knew had to be killed for me to eat. At this stage I didn’t know too much about what a vegan was and also didn’t know about the dairy and egg industries. I found out about veganism through the Vegan Society of New South Wales here in Australia who sent me the information for Animal Liberation Queensland and the Vegetarian and Vegan Society of Queensland – in my home State. Through these three groups I found out about the horrors of the egg and dairy industries. I didn’t want to contribute to killing animals, that’s why I became a vegetarian. I also didn’t want to contribute to the other industries that use and abuse animals. So at the beginning of 1997 I became vegan. I believe in speaking up whenever I see or hear of any injustices as well as not supporting companies that profit from exploitation. From social justice and human rights, to third world and poverty issues; to racial slurs and “jokes”, to feminist and gender equality issues; to fair trade and labour, to useable land and clean water for all of the earth; to overconsumption and waste, to anti-corporations and multinationals. All of these are as important to me as much as anti-speciesism. Veganism is the best way for me to live a compassionate lifestyle in line with all of my ethics of anti-exploitation. I am a committed vegan because I believe that we all need to tread as lightly as we can on the earth and to cause the least amount of pain and suffering to others while we’re here. Veganism is the best thing that I can do and the best way I know how to lead by example to stand against ALL injustices and exploitation that exist. I graduated from studying Naturopathy, Nutrition and Western Herbal Medicine over 10 years ago, and decided to release a vegan recipe calendar for 2006. This soon became my website vivalavegan.net - which has been online for over a decade! It really was just started to promote my recipe calendars (2006-2008) but as there wasn’t any websites like this – other than the Animal Liberation and Vegan/Veg societies – I had a lot of requests and great feedback from others on things to add. The website has had blogs, articles, interviews, a forum, videos, recipes, members section, mentors, and so much more over the past 10 years. I spoke out and wrote about about veganism, feminism and animal rights and was interviewed by a variety of people and publications. When I first became vegan, I joined in with all that Animal Liberation Queensland and the Vegetarian/Vegan Society of Queensland needed help with – from stalls in shopping centres, folding and posting newsletters, answering phones, handing out leaflets and more. I’ve also been on a variety of animal rights, environmental, and arts committees over the years, and even founded and ran my own not-for-profit Green Earth Group (2009-2013) to put on Brisbane’s first all-vegan environmental festival. I learned so much about people, volunteers, consumers, the mainstream and myself from this experience and you can read all about it in my free eBook. I enjoy and am good at communication in all of its forms so I use my skills in various ways to get the message of compassionate and anti-exploitation out. Writing and creating content for my vivalavegan.net website including articles, blogs, videos, books, podcasts, interviews etc. As with pretty much everything to do with Viva la Vegan!, someone would have asked me to give a talk on veganism at a vegan event and I would have said yes. Communication in all its forms is my forte, so I enjoy speaking, writing and interviewing people. Over the years, speaking, training and consulting has become my job – not just for veganism and the vegan lifestyle, but also for marketing, social media and communication. You will be speaking at this year’s Vegan Athletes Summit, but you’re not an athlete. What relationship does your work have with vegan athletes, and what can we learn from your experience? In 2012, I started an online interview series on my vivalavegan.net website with vegan athletes, fitness fanatics and exercise enthusiasts from all over the world. I found the responses really fascinating, informative and inspiring, and knew that many others would also. I made a pact with myself that if I was to gather at least 100 interviews, then I would create a print book with the interviews. Most of 2015 was spent finalising this, editing the interviews, sending out legal information to be signed, and then the arduous ready-for-print process. 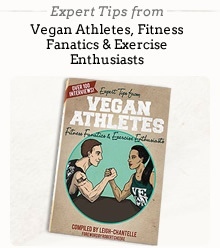 Expert Tips from Vegan Athletes, Fitness Fanatics & Exercise Enthusiasts is a collection of interviews with over 100 inspiring vegans who are immersed in the fitness world. They share their fitness training, knowledge and advice, their favourite foods, and just what to say when someone asks where they get their protein from! There are Olympians, professional sports people, personal trainers, and those who simply live for working out and being fit. My good friend, Robert Cheeke wrote the foreword, and a great vegan artist Weronika illustrated the cover. There’s 430 pages to read, 111 interviews, a heap of quotes and inspirational messages throughout. Because it’s in interview-style, it’s quite an easy read, you can flick to wherever you want, and it’s not necessary to read in succession. Every single person who has read the book is inspired by it, and I hope it reaches so many non-vegan people who really should know about plant-based protein in this day and age! Have you heard from many athletes about any nutritional hurdles they’ve had to overcome to ensure their body functions at its best? There’s a lot of health and nutrition evolution stories people have shared in my Vegan Athletes Book when people have become vegan. From cancers, obesity, and other major health challenges in the past, a lot of people are living more vibrant, healthier and fitter lives now. I don’t believe in veganism as a “cure all” diet, and it’s definitely a lot more than just a diet, but it’s awesome to see over 100 people thrive with their health and their chosen fitness goals - due to their commitment and consistency for their diet, fitness, and a ethical lifestyle. Millions of people have been watching this year’s Olympic Games, and for many it can be quite inspiring. What inspires you to be the best version of yourself you can be? Knowing yourself, your skill sets, passions, and challenges is a great place to start. I am a very goal-focused person and always have been. I surround myself with positive and inspiring people who are all genuine and living in line with their passions. I have removed all the negative people from my life and I have a really wonderful friendship group. I am really good with boundaries and try my best to take time out for myself. I love learning more, and am always willing to listen to other ideas and view points. I’m also involved in a lot of things beyond veganism and animal rights, that really helps to have a break. In most of the talks I give - whether it’s about marketing and promoting, business, social media or ethics - the best piece of advice I can give is to lead by example and be consistent. It’s really quite easy in theory, and the more you do it, the more it becomes a habit. What advice would you give to aspiring, or current athletes who may be interested in becoming vegan? Not just for athletes, but for anyone deciding to go vegan. Do your own research, track the sources back, find things that relate and are relevant to what your own interests are. Don’t just believe the person who speaks the loudest, is the most aggressive and has the most followers online. Follow people who have qualifications and have been doing what they’re doing for awhile. If you’re not vegan or vegetarian you might have to learn about some new things: how to eat differently, new foods, what to look for in the shops, how to read labels etc. It can be overwhelming at first, but start with what foods you buy, and work from there. In regards to athletes, work out your goal - is it to tone up, lose weight, put on muscle or prepare for a competition? Once you have this, you can find other people doing similar things, see if they have any tips, and work towards your goals. My Vegan Athletes Book has so many tips from over 100 fitness-obsessed vegans from a variety of disciplines. I know of many people who have been inspired by the interviews, so I hope you will too. What do you see as being the biggest obstacles to the future growth of veganism, and the biggest factors behind its current growth? I’ve been vegan for 20 years in January 2017, and there’s been quite a difference over the past two decades. Originally when people were vegetarian they didn’t eat any animal flesh - maybe eggs and dairy - but never flesh. Nowadays people are more flexitarian than vegetarian, and go where the wind takes them day in, day out! As for the vegan and animal rights movement, when I first became vegan there weren’t really many young people who were vegan. It was quite hard to meet other vegans around my age in the Brisbane area in 1997. The majority of my vegan and animal rights advocate friends were interstate, so I would only see them a few times a year. It’s a lot different now, there’s so many vegans of all ages. I think this would be due to the Internet connecting us, as well as the fact there are just so many vegan places - or places that can cater to vegans - where you can always meet someone new! I also feel that 20 years ago a lot more people who were vegan were concerned about animal rights and animal ethics. There’s been ebbs and flows of relevant vegan information getting into the mainstream over that time. From no fur campaigns, Stop Huntingdon Animal Cruelty (SHAC), various instances of animals being liberated from their prisons, and more media attention to the way animals are treated e.g. animal testing, live animal trade, wool, greyhounds etc. But one thing I’ve noticed in the past 5 years in particular is the plethora of vegan blogs, online posts on Social Media, events, talks and people who are primarily or only focused on food, and plant-based, health and aesthetic aspects of veganism – to the detriment of the ethics and animal rights issues. I see that a lot of vegans - especially the new ones - being really concerned about specific food within the vegan food staples. For example, I see a lot of people who are focused on high-carb, low-fat diets, or no oil diets, or raw diets. I do think that this dietary focus is diluting the ethical core of the vegan and animal rights movement. I understand that with the massive amount of not-so-healthy vegan foods nowadays, that we all need to be careful, and know that just because it’s vegan and plant-based it’s not necessarily healthy. I see people online saying that they’re vegan for the animals a lot more - 20 years ago that was just a given. You would meet another vegan and would feel instantly connected to them. Now when someone tells me they’re vegan, I have to pause for a bit to work out what exactly that means to them - e.g. losing weight, looking hot and posting half-naked photos of themselves online, or something beyond themselves e.g. about the animals. Like everything nowadays, we’ve got to put a bit more energy into searching through the noise to find the gems. I personally think that the term “vegan” has been watered down – especially in mainstream media – with so many people not really knowing or caring about the whole vegan ethical lifestyle. Some vegans think that being vegan is where their compassion can stop. There are so many other issues and ethics that I hope I can raise people’s awareness towards. In a lot of my talks I focus more on the intersectionality aspects of veganism, how we can all aim to do a bit better, and work at consciousness-raising going forward. I hope to see more people learning about these things, and doing something to change our movement going forward. The scene is now quite fragmented - and not just with the activists vs welfarists, or the health-conscious vs the straight-edge vegans. Over the past 5 years in particular there’s been a massive boom of vegan products and services as there’s money to be made now. 20 years ago, a lot of us were flying the vegan flag because not many other people were, and we felt we needed to be the people doing this - not a lot of money was to be made then as there just wasn’t much of a market. Now, there’s a lot of information out there, a lot of vegan services and goods from businesses that may or may not be vegan, but also maybe not be that ethical in other ways. Veganism is the buzz word at the moment, but it will stay around a lot longer than the fad diets that are being promoted nowadays. Probably the major thing that still takes me aback is that vegan food can be found in most places nowadays. 20 years ago, you were lucky to get soy milk at the supermarket, and dark chocolate or carob chocolate at the health food store. Everywhere I go now, I find more and more places with vegan options, and an excessive amount of vegan goods. I still find this hard to get used to - especially when I go to remote areas - as people who are vegan now really don’t realise how hard it was to source vegan items! The scarcity elements of being vegan just don’t exist in most areas now. It’s incredibly easy now to be - and stay - vegan. A lot more people are eating a mostly plant-based diet, more people are eating more plant-based meals. But there is evidence that meat consumption is also rising. We still have the same amount of vegans: 1-2% of the population, and this figure hasn’t changed for 20 years. A lot of people think I’m being pessimistic when I mention these facts, but it’s reality. People who only have vegan friends, and only get vegan information are going to think there’s a lot more vegans, but is there really? There’s a lot more mainstream coverage of the dietary aspects of veganism, but so many people are just confused with what a vegan really means. “It has something to do with not eating gluten, right? !” There’s still a lot of work to be done, and I really want to take this moment to encourage every single person to do something new to promote the ethics of veganism in the most positive and most inclusive way you can. Finally, what do we have to look forward to from you at this year’s Vegfest UK Athletes Summit? I’m going to be delivering a Skype presentation from Melbourne where I’ll be for World Vegan Day. I’ll be speaking about what I’ve learned in my 20 years as a vegan, running my Viva la Vegan! website for over a decade, and my latest book on vegan athletes. The Vegan Athletes Book will be for sale at the Vegetarian Guides stall over the weekend. Robert Cheeke and a selection of others from the book (including Christine Vardaros, Fiona Oakes, Kate Strong and Pat Reeves) will be giving talks and be around to sign a copy of the book too! Please see: vivalavegan.net . veganathletesbook.com . leigh-chantelle.com for more about Leigh-Chantelle.